Western Knowledge Production and the P.R.C. Western Knowledge Production and the P.R.C. Milton Park, Abingdon, UK: Routledge, 2012. 190 pp. Vukovich’s book astutely engages with recent “Western” representations of China’s past and present. 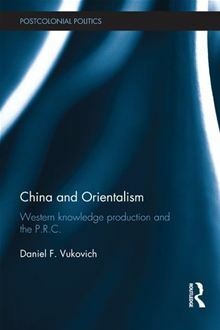 The book’s seven chapters analyze ways in which the China field, which Vukovich understands “in its broadest sense as knowledge about China produced outside of China,” has yet to adequately decolonize its categories of understanding or frames of analysis (6). Taking Sinological-orientalism to be visible in its “system of dispersion” (Foucault’s term for regularities discernible among apparently discontinuous statements, texts, and objects), Vukovich parses scholarship and journalism about the Great Leap Forward and the 1989 Tiananmen demonstrations, academic reception of Chinese feature films, a novel by Don DeLillo, and the “China reference” ubiquitous in much contemporary theory (126). The book’s well-demonstrated main argument is that contemporary orientalist discourse concerning China, rather than maintaining China’s essential difference, now casts the polity as increasingly similar to an idealized West. This similarity, however, remains “structured by a hierarchical difference” which maintains the “positional superiority” of both the inquisitor and the West itself (2-3). Sinological-orientalism concomitantly denigrates Maoism as having diverted China from a normal development path and treats it as a ghost haunting China’s present which must be exorcised if normalcy (i.e., sameness with the liberal, capitalist, democratic West) is to be achieved. This not only disregards the Maoist period’s social welfare achievements and its committed anti-colonialism, it also presumes that the Chinese have approached the end of history (to which the West has already arrived) and must no longer entertain any alternative. Ultimately, Vukovich’s book sounds a welcome call to take Maoist China seriously as, paraphrasing Zhang Xudong, an “irreducibly complex world of life,” and reminds those who write about China’s present and past to critically reflect on the historicity and politics of their own representations (117). Chapter 1, “Sinological Orientalism Now,” addresses the historical emergence and general contours of the discourse of “becoming-the-same.” Chapter 2, “Uncivil Society, or, China and Tiananmen, 1989” argues that rubrics deployed by “China watchers” to interpret the 1989 demonstrations have functioned to maintain the positional superiority of the West by casting participants as inadequately conforming to liberal democratic norms. Chapter 3, “Maoist Discourse and its Demonization” examines ways in which scholars have failed to take Maoism seriously on its own terms. The following chapter, “Accounting for the Great Leap Forward,” picks up this thread by assessing how recent writing on the post-Great Leap famine has trumpeted questionably-derived death tolls at the expense of developing a rigorous methodology to explain how the Leap–presented here as a benignly intended strategy for egalitarian rural development in an impoverished, decolonizing country–ultimately resulted in catastrophe. Chapter 5, “DeLillo, Warhol, and the Specter of Mao,” traces the circulation of “truisms” about Maoism through Don DeLillo’s novel Mao II, while chapter 6, “Screening Sinology,” looks at how Chinese films of the 1980s and 1990s are frequently interpreted as transparent windows on Chinese reality and scoured for anti-CCP positions. Finally, chapter 7, “The China-reference and Orientalism in the Global Economy,” considers how contemporary theorists, including Antonio Negri, Michael Hardt, and Giorgio Agamben, feel compelled to reference China without the corresponding intent “to actually say something insightful or even thoughtful or accurate about China, but to help prove the truth of said theorists’ theoretical and political claims” (128). Vukovich also insightfully addresses how a racialized concept of totalitarianism informs the chronologically confused depiction of Maoism in DeLillo’s novel Mao II, as well as efforts to equate Maoism with fundamentalist Islam (50-51). Such gestures not only conflate radically opposed political agendas but also unreflexively conjure the specter of non-white subjects collectively haunting an imperiled West. Against such ahistorical modes of inquiry, Vukovich proposes that we at the very least begin by taking Maoist categories of self-understanding seriously–for instance, by recognizing the salience of the “two-line struggle”–and by remaining open to the prospect that the society under investigation can and will challenge our “a priori assumptions, conclusions, and discourse” (3, 107-108). The book is at its strongest when it reads sources and phenomena against Sinological-orientalist grains. For instance, in chapter two Vukovich offers a brilliant interpretation of the poetry that adorned worker placards during the 1989 Tiananmen demonstrations. Rather than attempting to see in the protests the emergence of “civil society”–a formation and concept Vukovich finds wanting everywhere in the world–he invites us to reflect on the significance of working class participation and how workers themselves framed their own actions. Their expressed desire to “expel the dictators” should not be seen as anachronistic in 1989 but as a very urgent response to an increasingly “ignoble existence” that belied the very idea of civil society (39). In chapter four, Vukovich suggests ways of understanding the famine that followed the Great Leap Forward that neither inflate Mao’s role nor rely on problematic accounting methods to reach an outsized death toll. He instead helpfully points us to scholarship by Carl Riskin, Utsa Patnaik, and others who have located the roots of the famine in ill-coordinated planning and the too-rapid eclipse of extant market structures. Equally insightful are the readings in chapter six of the films To Live, Yellow Earth, and In the Heat of the Sun, which caution against rushing “to code [such] films as either for or against the government and/or Maoism” as well as the assumption that “to be good they must be ‘subversive'” (119). Although Vukovich circumscribes his study to the Maoist period and after, China and Orientalism would have benefited from a deeper inquiry into the historical roots of the trope of China’s “becoming-the-same.” While he convincingly argues that this trope has become dominant within our neoliberal, post-Cold War present, it is also the case that ideas about China’s prospective homogenization with the West have had a strong and enduring place in U.S. discourse, arguably more explicitly than in the French civilizing mission briefly mentioned in the book (5). This idea was at the core of the turn-of-the-twentieth-century American missionary enterprise (that the heathen Chinese could eventually, with proper white-Christian guidance, become modern, rational, capitalist subjects). It was also a notion deftly promoted at midcentury to a U.S. audience by Guomindang spokespeople such as Soong May-ling, who found an eager mouthpiece in Henry Luce’s Time-Life empire. Moreover, becoming-the-same was also at the core of postwar modernization theory, with its denial of coevalness, explicit anti-communism, and expectation that, given proper conditions, recently decolonized populations could one day catch up with the First World. Though Vukovich raises this latter point, he might have more directly addressed the fact that becoming-sameness appeared during the Cold War and well before, and how we should account for the dominance of this trope at different points in time. Finally, even though Vukovich does not confine his study to American scholarship or cultural production, since many of his examples are drawn from the U.S. context his book could have benefited from a more substantive engagement with extant literature on American orientalism, including works by Christina Klein, Karen Leong, and Mari Yoshihara. This would not only have created a welcome bridge between China Studies and American/Asian-American Studies, but would have illuminated links within Sinological-orientalism’s “system of dispersion”–such as the popular-cultural mediations between Don DeLillo and academic writing about Maoism. These issues aside, China and Orientalism constitutes a challenging and illuminating book that will hopefully be read and discussed widely. [ 1 ] James C. Scott, “Tyranny of the Ladle.” The London Review of Books 34 no. 23 (Dec. 6, 2012), 21.